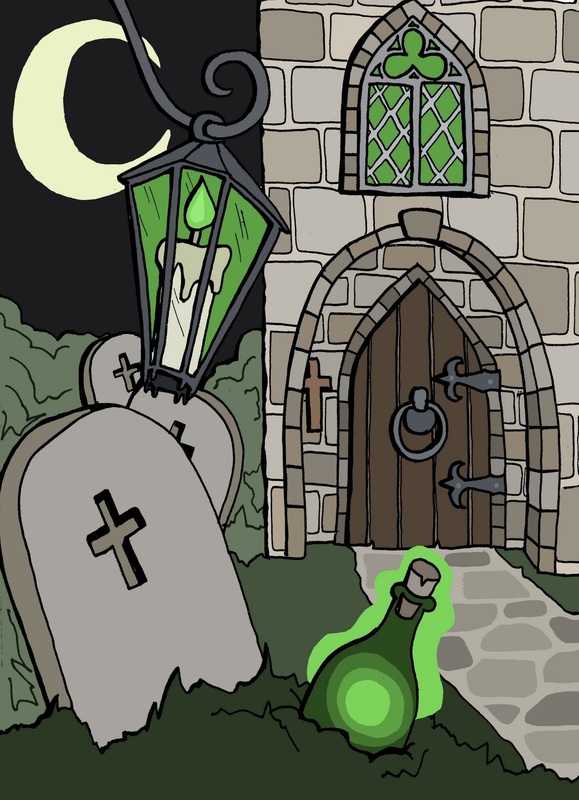 This weeks Illustration Friday prompt got me thinking whether there are any tales of ghostly happenings around where I live, and it turns out there are a few! "Burials have not been permitted at the Priory Church in Dunstable for some time over concerns of releasing an evil that is buried there. A long time ago a witch called Sally was burnt at the stake along with her cat and broomstick but she returned to haunt the priory which stood on the site where the Priory church now stands. Ghostly hands would box the monks around their ears and the altar candles would burn with an evil green light. If Sally's ghostly fingers touched the prayer books the covers would be singed. Things got so bad that a Palmer (a wandering medieval European pilgrim who carried a palm branch as a token of having visited the Holy Land) was called in to remove the spirit. As the Palmer began the service Sally struck him so hard about the head that he fell to the floor of the Chancel. Eventually the Palmer outwitted Sally by luring her into a bottle. This bottle was then buried in the grounds of the Priory church but no one knows where. 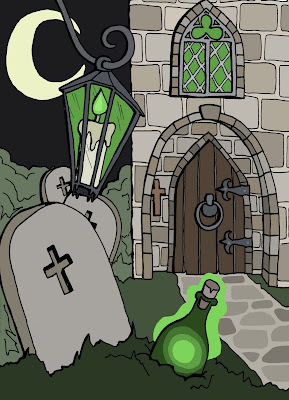 No more burials were allowed which might break the bottle and release the witch." ooohhh Scary!!! Love how you have done the bottle! I was just readin your intro and noticed you studied at Coventry Uni, I went there too :)but did graphic design & illustration and graduated 2006. Who was your tutor for Illustration? I think it's a great illustration. I really like the greens and browns. Sometimes a limited palette is much cooler than one with lots of colors. thanks for the comments lovely! that's probably true cindy, stories like these tend to get exaggerated somewhat over time! wow dina small world! i had glynn and francis for illustration, they were fantastic. doing the joint honours was bloomin' hard work at times but i loved it there! Ohhh cool, I had them too! Gynn had only just started working at the university at that point. Francis was a great tutor too. I know tell me about it, joint courses are hard. Your work is fab btw!